320 Acres in Saguache County 1-2 miles off the main highway of 285 this hunting/grazing land is bordering state forestry division land. There is an artesian well already drilled on the property. It is very old and now the Water District set a requirement, requiring the owner to put a meter on the well and join the subdistrict. 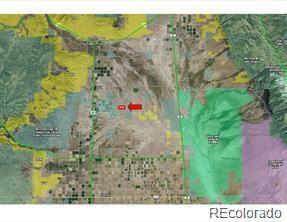 The subdistrict is not ready to be completely formed so the seller discloses to the buyer upon purchase of this land subject the buyer must join the water district. The buyer can comply at closing if water dept requires. We are trying to figure out access on this parcel. No covenants, plenty of space, and spectacular views of the surrounding mountain ranges. Seller is willing to offer owner carry financing terms to qualified buyers, and at least 20% down. Seller / Listing Agent is a licensed agent in the state of Colorado. Offered by Your Castle Real Estate Inc.